MBOX converter tool can export MBOX files in bulk which are stored all together in a folder. The folder can be given as an input to the tool and can convert all Emails of different MBOX in a single PST file. Moreover, you can save each MBOX in a separate PST file. If you have corrupted MBOX file, then this MBOX mail Converter tool will firstly repair and then convert MBOX to EML and other file formats. This is also helpful in recovering deleted emails in MBOX along with its attachments. PST: This file is supported by MS Outlook Application. EML: This file format is supported by multiple email clients such as Windows Live Mail, Outlook Express etc used for single email file. 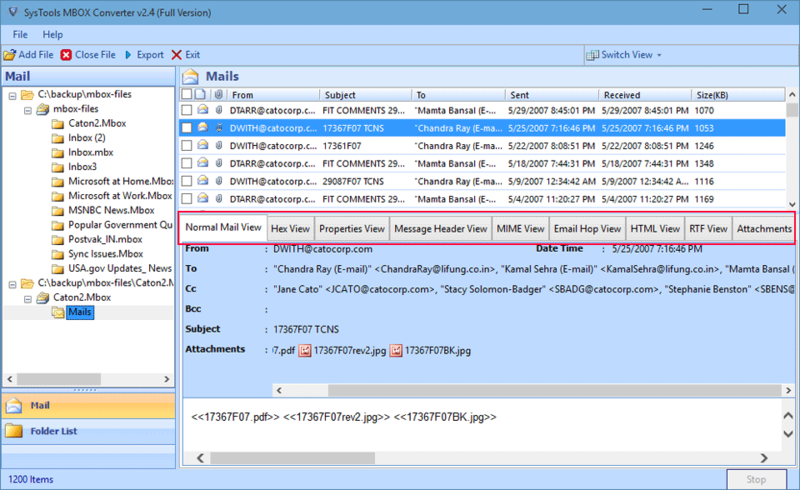 MSG: It is used for single email in MS Outlook. NSF: This file is supported to Lotus Notes Application. This MBOX Converter tool supports multiple types of MBOX file formats like .mbx or .mbox or MBOX file and transfer MBOX to PST and other file format. These MBOX files are developed by several different email applications such as Eudora, Apple Mail, Spicebird, Pocomail, Sea monkey etc. While exporting MBOX to PST and other formats, you can select the desired emails by checking the box, the software will convert only specific items to the selected email format like PST, EML, MSF or NSF. This option is given when user select the option to export MBOX to EML or MSG, you will be provided with several file naming option which is helpful to easily recognize and convert MBOX emails. Also, the managing of Emails in EML or MSG format after conversion is more simpler. If a user has installed Email Applications like Thunderbird, Sea Monkey, Entourage, Pocomail etc which stores emails in MBOX file, then the MBOX Email Converter automatically detects the location of Clients data to convert MBOX file. There is no need to search or browse the file. If user selects the export option as PST which is supported by MS Outlook, this tool can easily convert MBOX files to PST format without the need of Outlook installation in their system. After complete MBOX file conversion, a detailed report of transfer MBOX file to PST and other file format is generated for future reference. You can save this report either in CSV format or in HTML format. MBOX is called mailbox. A MBOX file is a data storage file used to store the message in a single text file. It saves messages in a concatenated format where each message stored one after another starts with “FROM”. MBOX file is of different types, it can be with extension .mbox, .mbx and it can also be without any extension.You can open and view this in notepad to understand the structure of Email storage in MBOX file. This file is created by many different email clients such as Thunderbird, Sea Monkey, Netscape, Pocomail, Eudora, Entourage, Windows Live Mail etc. MBOX file supports to all these email clients in Windows. 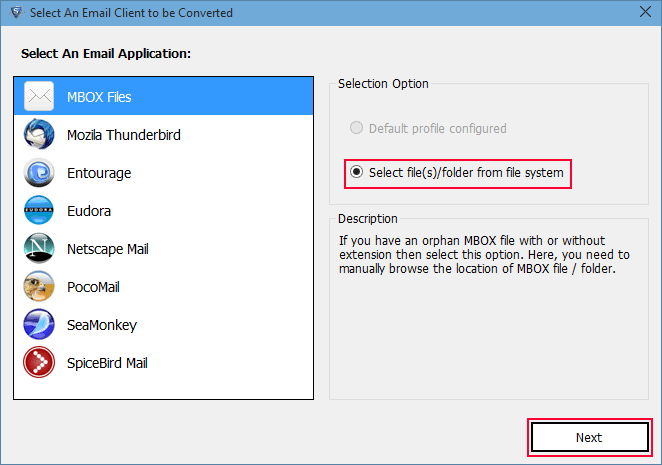 When an Outlook user received an MBOX file but do not have any application which supports the file, then in that situation export MBOX file is the only option. By using a convert MBOX into PST tool, the files can easily be accessed in MS Outlook. Another scenario is when a person used to work in MBOX supported applications but now they want to move their work to another application like Outlook or Lotus Notes then you need to convert the MBOX file in PST or NSF format respectively. Step 2: Select the Email Client installed in your system. Step 3: Preview of MBOX emails and ita data items. Step 4: Choose the Export options. Watch live video of MBOX Email Converter software working methodology. This video has made for users to get an easy understanding of software working and its remarkable features. Can I export multiple MBOX files in bulk using your MBOX converter Tool? Yes, this MBOX file converter software can convert MBOX files in batch. You can place all MBOX files in a folder and can convert them all to PST, NSF, MSG files. Is the Conversion of MBOX into PST file is possible without Outlook installation? 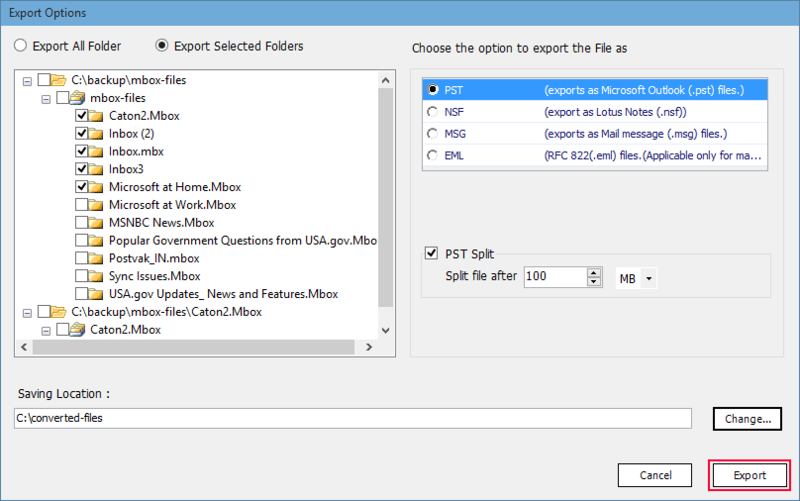 Yes, MBOX Email converter doesn’t need MS Outlook installed in system to export MBOX to PST file. Is it possible to convert multiple MBOX files into a single PST file? 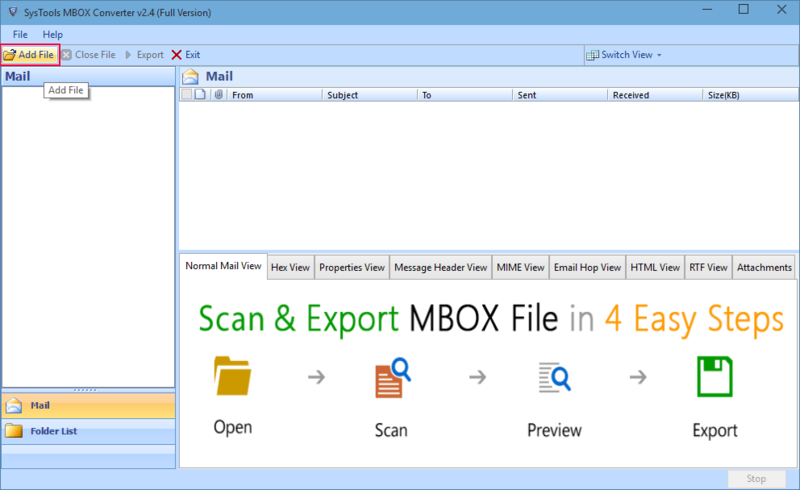 Yes MBOX converter tool gives you the choice to save the exported mails into one single PST. Moreover, you can store each converted MBOX emails into a seperate and different PST file. I have MBOX file but some mails have been deleted from it accidentally, can I recover it and access them in Lotus Notes? Yes, this MBOX to NSF converter tool also provides the option of to recover the deleted emails of the MBOX file. And after recovering the emails convert MBOX to NSF file format very easily. Is the Convert MBOX tool compatible with Windows 8? Yes, MBOX converter software supports Windows 10, 8.1, 8 and all below versions. Atleast 512 MB RAM in system is required (1 GB recommended). Minimum 30 MB of free hard disk space is required to run this software. This tool is supported in Windows 8.1 & below versions. 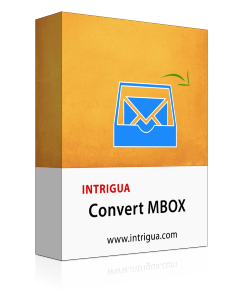 MBOX Email Converter tool is a very helpful tool to convert MBOX files of any email clients to different formats. I am very thankful to the develpment and support team of Intrigua Convert MBOX for helping me throughout the installation procedure. While working with my data, some of my emails got permanently deleted from MBOX file. After some days, I found out the solution MBOX email Converter software which recovered my deleted emails and repaired the corrupted MBOX file. I recommend this tool to every troubled MBOX file user. MBOX Email Converter for Mac allows batch conversion of Mac MBOX to PST Outlook file format. On adding MBOX files, it will automatically scan and loads MBOX files and export it into Outlook PST. Mac MBOX Converter tool allows to convert multiple MBOX files to single EML files for each mail separately. This conversion allows user to open each mail in a separate file. Convert MBOX tool supports the conversion of any type of MBOX files to html format. This html file can be opened and run in any browser. Each mail is converted into a separate Html file for more convenience and easy understanding. MBOX Mac converter facilitated the user with the option to convert MBOX files of any email clients to adobe PDF format. And for the ease of the user, the Convert MBOX tool creates separate PDF file for each MBOX file. MBOX file converter Software allows to export multiple MBOX files to any of four export options PST, EML, PDF, HTML format. The bulk MBOX conversion to PST and other format can be performed at the same time congruently. MBOX email converter for Mac provides the option to apply emails filters to perform selective conversion. It will export only selected emails by applying filters in “To” and “From” option. This feature saves a lot of time and effort required in manual selection of MBOX mails for conversion. Step 4:Select the Export options. Does MBOX converter tool allows to export bulk of MBOX files at a time? Yes, it is capable to convert multiple MBOX files and all at once in PST/EML/HTML/PDF file format. Does this tool supports Mac OS Sierra version 10.12.4 and lower versions? Yes this tool is compatible with MBOX files from any mac OS versions. Is this software creates separate pdf and html file for each Mail? Mac MBOX converter creates different pdf file and html file for each mails of MBOX files. Processor: Mac Computer with Intel Processor. Minimum 70MB of free hard disk space is required to run this software. This tool supports to MAC OS X 10.10 Yosemite and 10.12 Sierra versions. I am a Mac user, this MBOX converter software for Mac OS is really very useful to convert into PST. I am thankful to such a great development which solves the problems of all Mac users who wants to do MBOX conversion. Thanks to avail this Mac MBOX to pst converter tool, it helped me lot for converting bulk of MBOX files to Outlook pst format. I rarely did found any tool which have so many features as this MBOX converter.